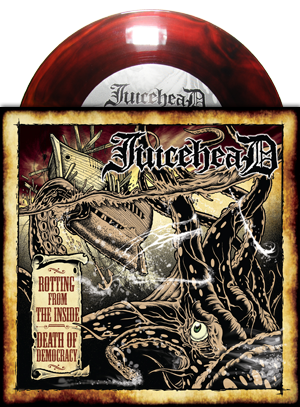 Two songs from Juicehead’s (then forthcoming), full-length breakthrough studio album “How to Sail a Sinking Ship” chum the waters on this Ltd Ed. vinyl 7-inch single with Digital Download card. The power-punk trio hailing from Chicago combine a diverse range of musical styles & influences into their own blistering blend of punk rock. The first pressing, a Record Store Day exclusive vinyl colorway, was available in a highly Limited Ed. of 500 pcs worldwide. The record is perfectly suited to match the foreboding stormy skyline in the sleeve art, combining a color mix of gold and oil spill inflected deep ruby swirled vinyl. 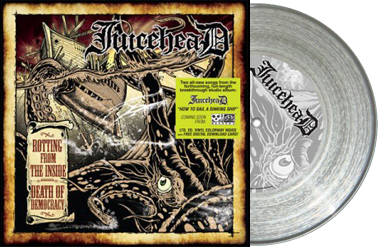 The Record Store Day Edition quickly SOLD OUT and a 2nd pressing followed on clear vinyl (Ltd to 350 pcs) with a 1-in-4 chance at a randomly inserted “smoked” clear vinyl variant (Ltd to 150 pcs) worldwide. 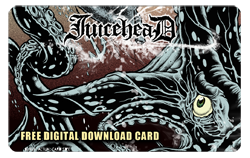 Both editions of the 7-inch includes a free, collectible Juicehead digital download card redeemable anywhere in the world for MP3s of both songs: “Rotting from the Inside” (Side A) and “Death of Democracy” (Side B). 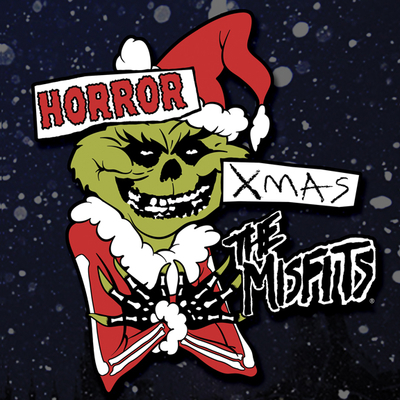 The single (and the full-length that followed) were produced by longtime Misfits & Ramones collaborator John Cafiero. 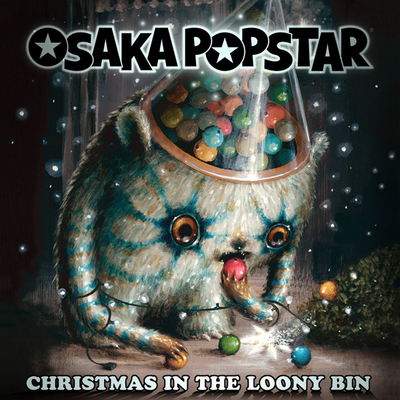 Producer/Osaka Popstar frontman Cafiero also appears on guest backing vocals for the A-side title track. The fierce and iconic 7-inch sleeve was illustrated by artist Joe King whose credits include designs for Crooks N Castles, Billabong & Obey Giant (among others) and was recommended for the project to John Cafiero by Obey’s Shepard Fairey personally. 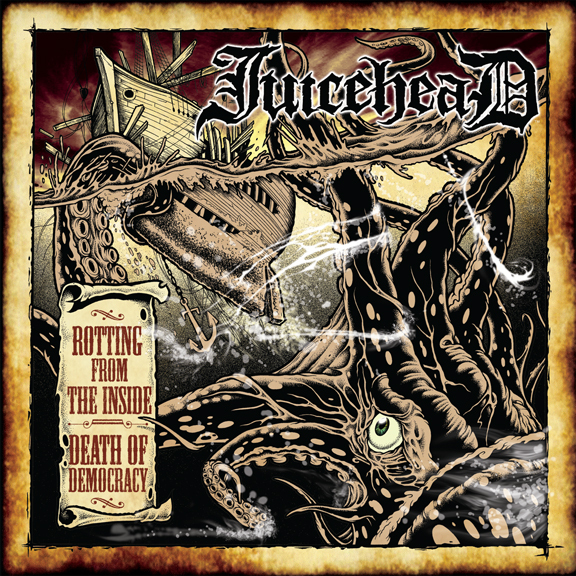 Both tracks would later appear on Juicehead’s full-length studio album “How to Sail a Sinking Ship” released in October 4, 2011 on Misfits Records. 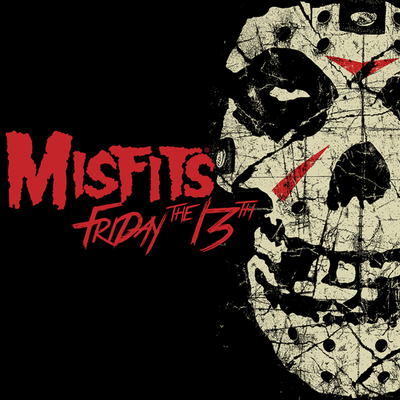 The first track from the single, “Rotting from the Inside”, debuted at #40 and eventually climbed to #33 on the Alternative Specialty Radio Charts with consistent spins on both college and commercial radio nationwide. Track two, “Death of Democracy” also surfaced on air nationwide in heavy rotation on Sirius XM’s Faction channel on a daily basis.